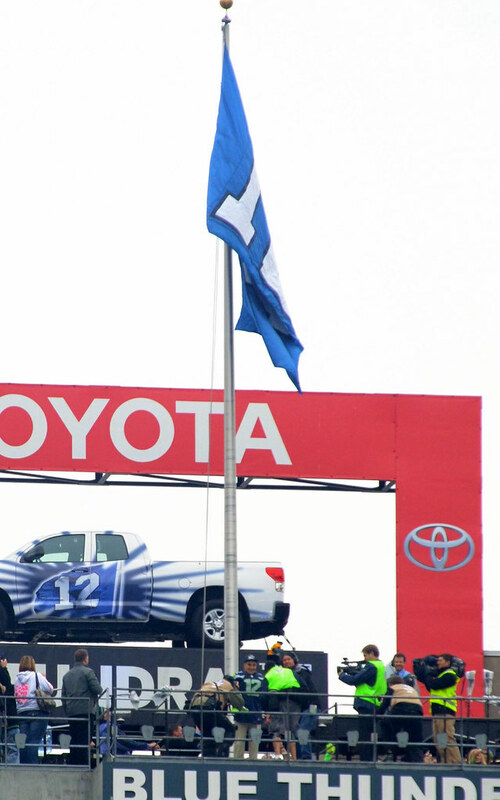 There may not be such a thing as an “easy win” in the NFL, but the Seattle Seahawks sure made it look like it. The New York Jets had absolutely no chance against our Seahawks on Veteran’s Day, as the defense utterly dominated while the offense had no problem getting in the end zone in the 28-7 win. Marshawn Lynch had as many rushing yards as Sanchez had passing yards (124), and Golden Tate had more passing yards (23) than Tebow had through the air and on the ground (22). Tate also threw for a touchdown, which Sanchez would have tied if not for a Richard Sherman interception. 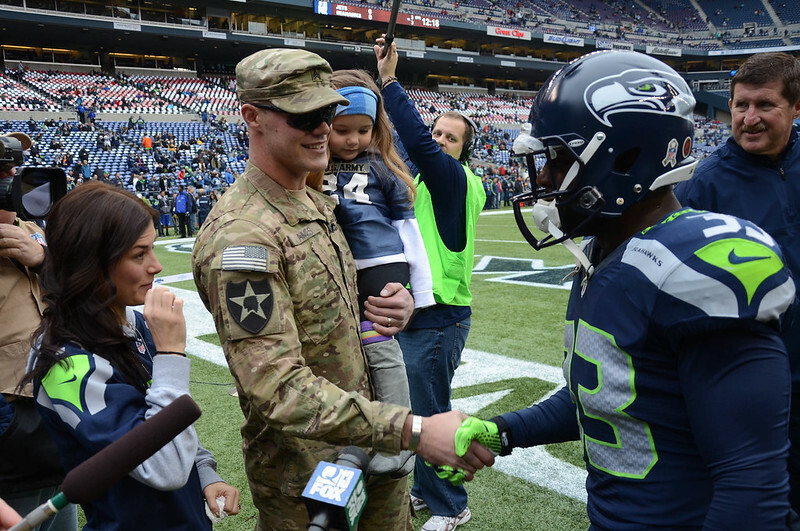 If it wasn’t the Jets offering the gift of a win to all military veterans in attendance, the Seahawks defense sure made it seem that way. 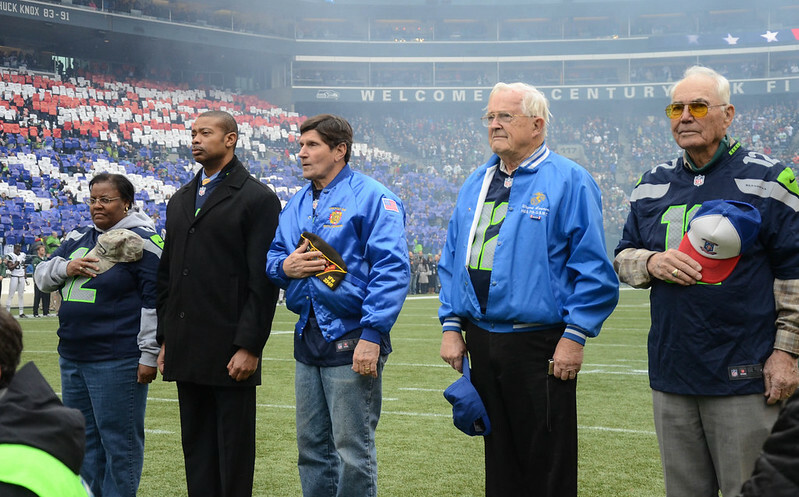 Prior to kickoff, Army veteran Armando Mejia, Coast Guard veteran Mike Flood and Master Sgt. 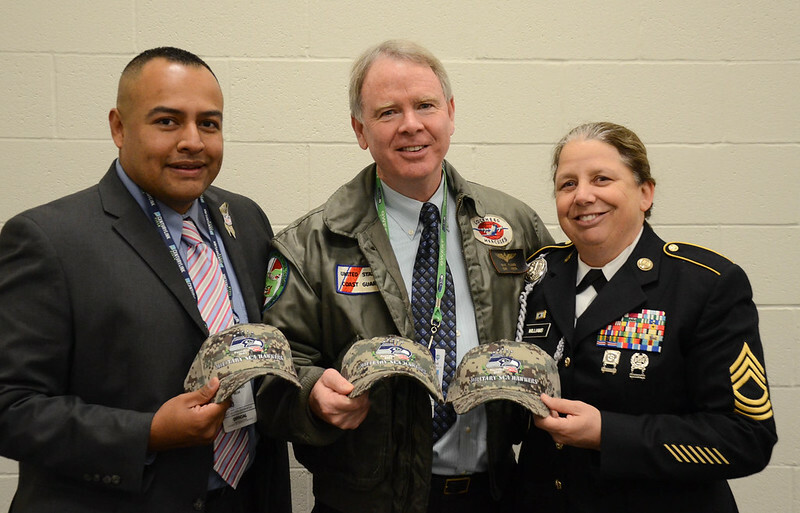 Traci Williams show off the new Military Sea Hawkers ball caps. 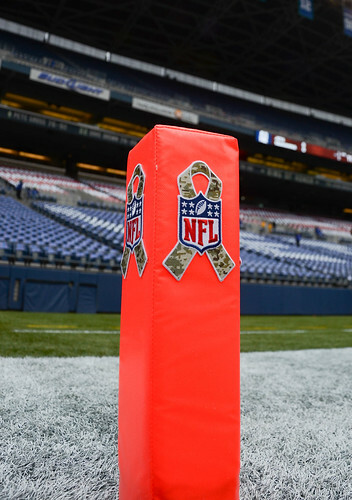 Each of the pylons carried the NFL’s Salute to Service ribbon. 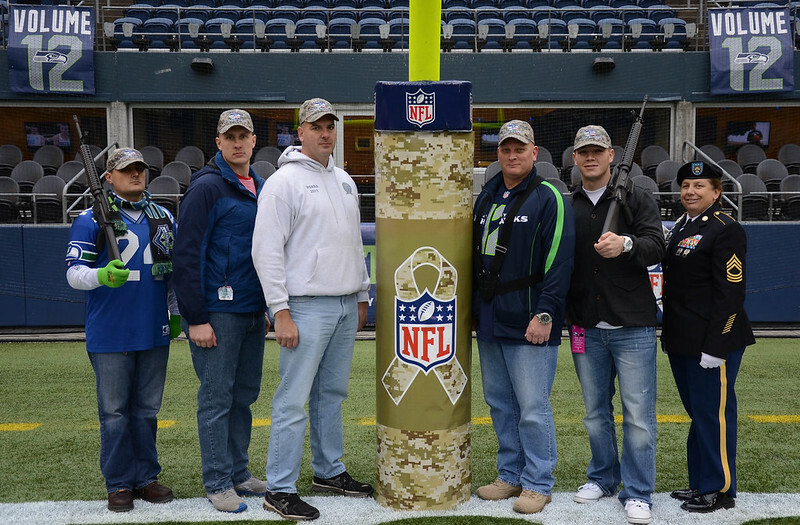 The Military Sea Hawkers Color Guard poses with the camouflaged goal post wraps. 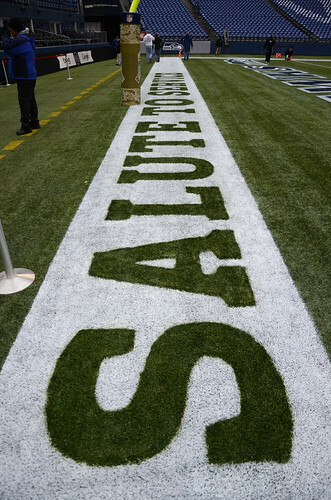 “Salute to Service” was outlined by the white paint in the back of each end zone. Seahawks linebacker K.J. 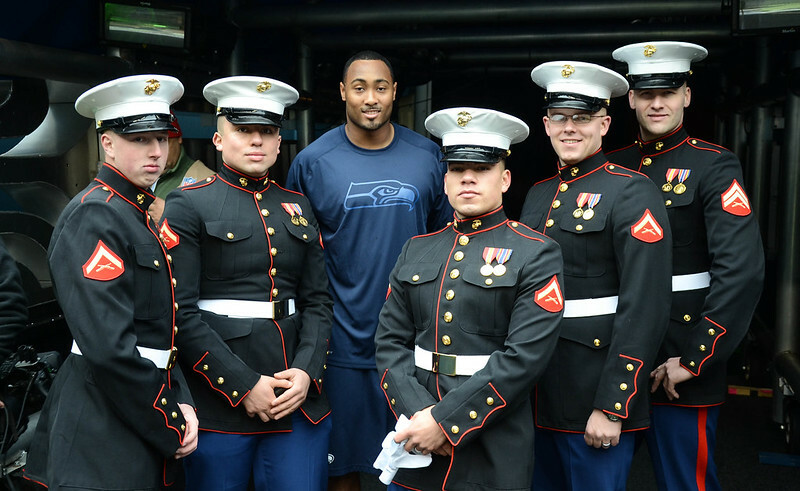 Wright joined five Marines in the tunnel prior to kickoff. 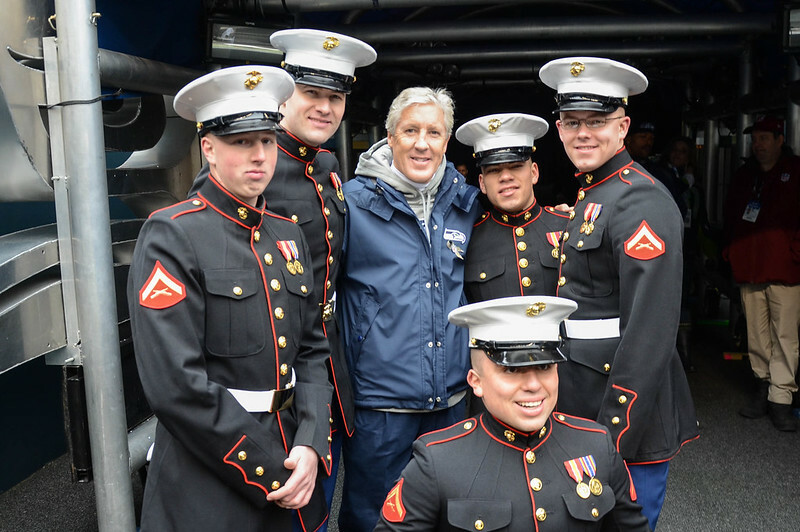 Seahawks Head Coach Pete Carroll came out for photos as well. Army Sgt. Zach Ames flew in prior to the game to surprise his wife and daughter right before kickoff. Seahawks runningback Leon Washington came over to congratulate Ames and his family. 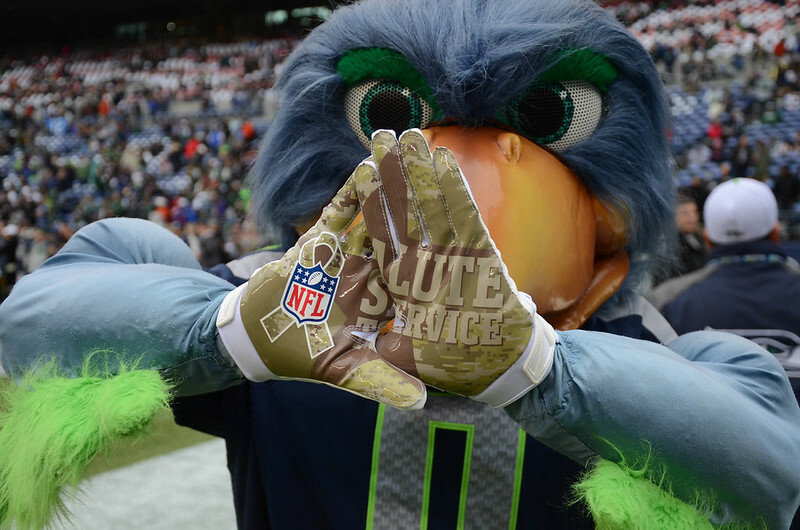 Seahawks mascot Blitz shows off the NFL’s Salute to Service gloves. 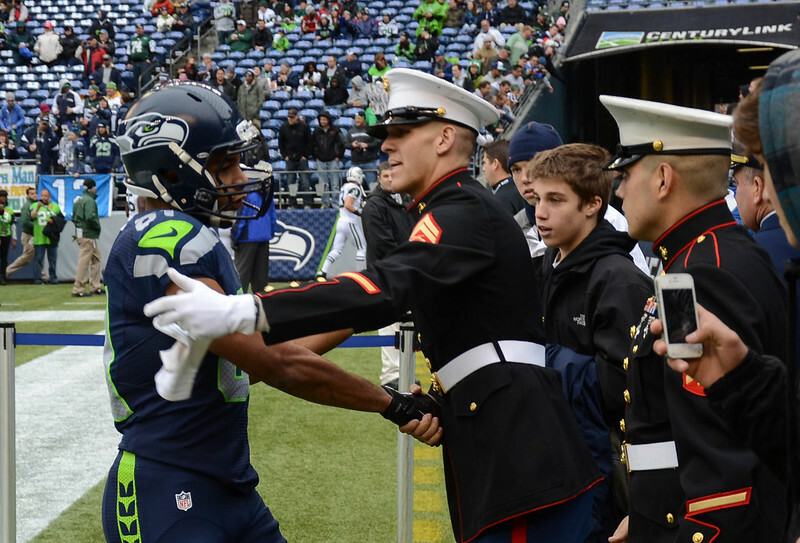 Golden Tate showed his appreciation by shaking hands with Marines standing on the sidelines prior to the game. 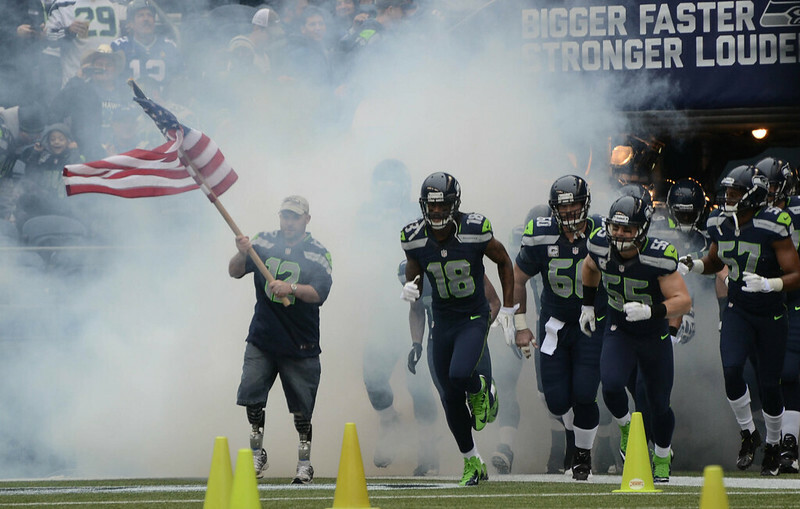 Army veteran and Wounded Warrior Erin Schaefer led the Seahawks onto the field carrying the American flag. 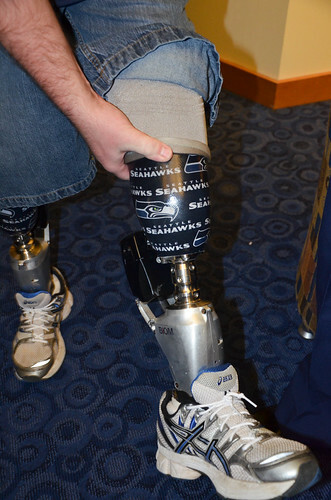 Schaefer proudly flys the Seahawks colors on each of his prosthetic legs. 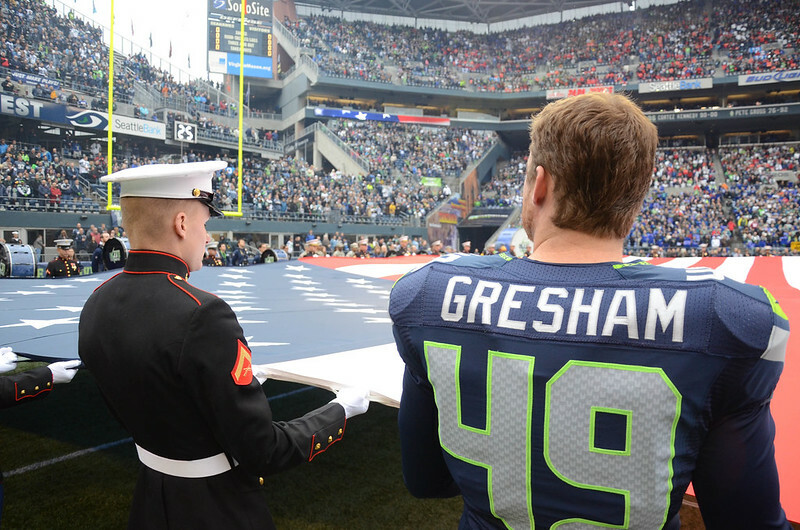 Clint Gresham and other members of the Seahawks joined Marines holding the flag during the National Anthem. 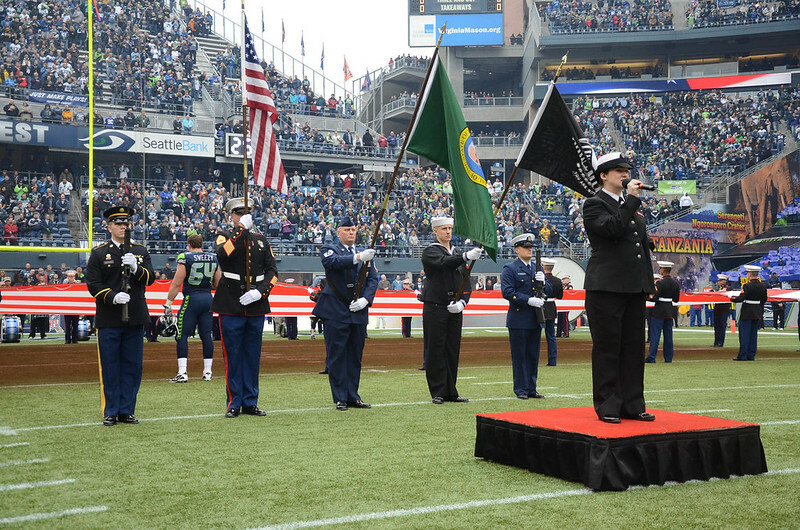 Musician Third Class Sarah Reasner performed the national anthem joined by the Military Sea Hawkers Color Guard. Veterans from World War II, the Korean War, Vietnam War, Gulf War and Operation Enduring/Iraqi Freedom stood at midfield during the anthem. 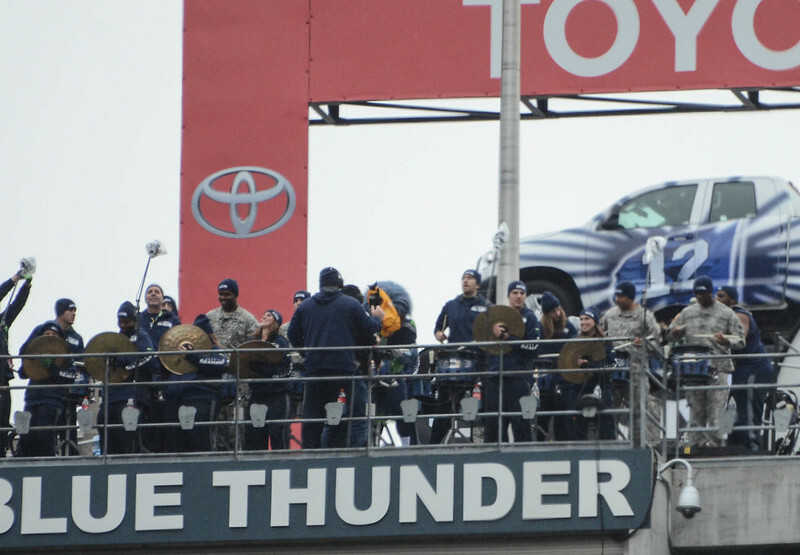 Sailors and Mariners cheered on the Seahawks from a suite in the north end zone. 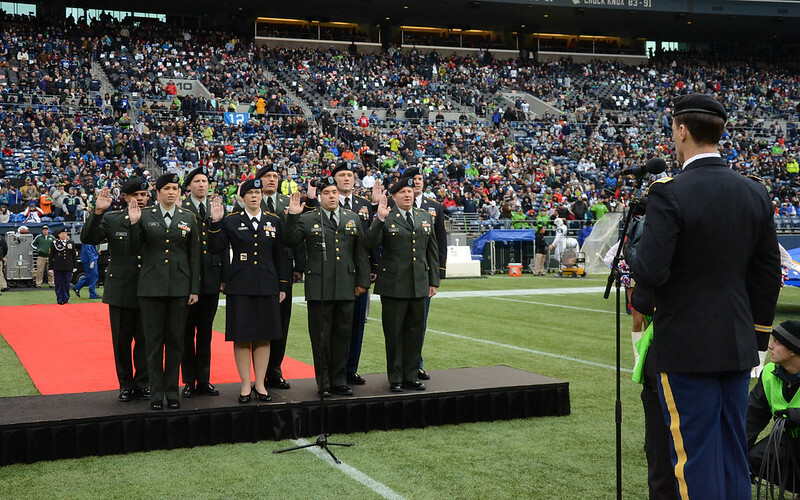 Washington Army National Guardsmen from Camp Murray were center stage for a halftime reenlistment ceremony. 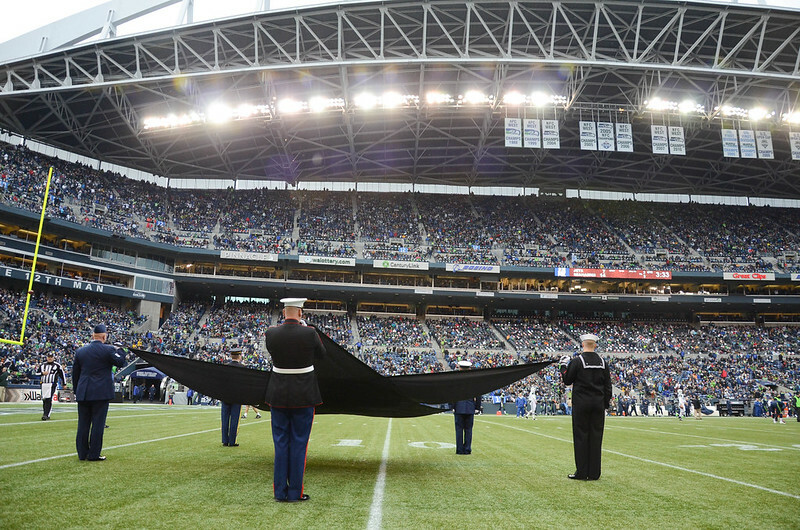 A star-shaped flag represented each military service and POW/MIA flags during the halftime ceremony. 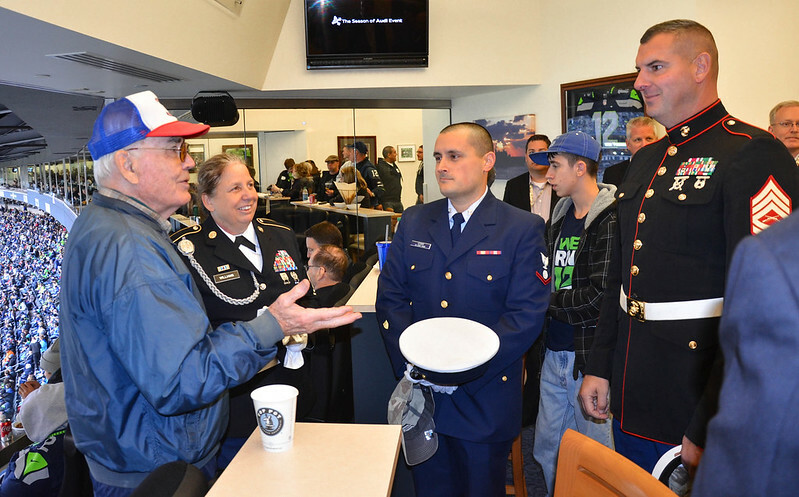 USAA invited several veterans and service members to their suite for the game. 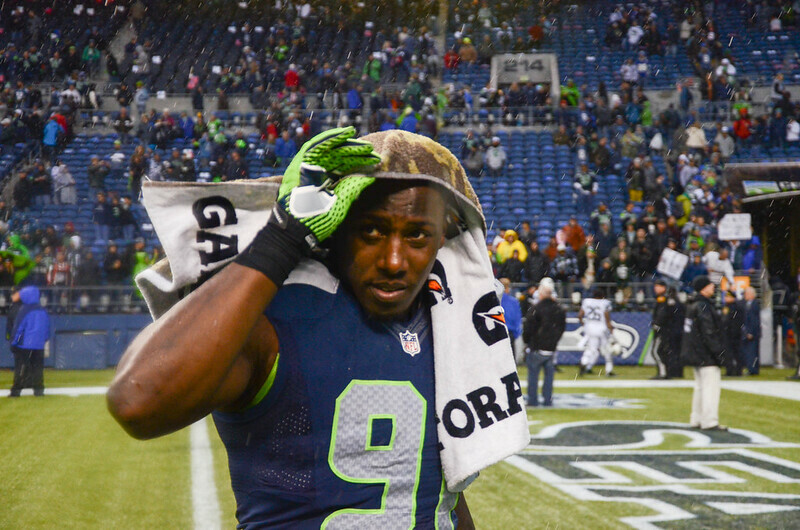 Seahawks defensive end Chris Clemons dries off with a camouflaged towel designed for the military appreciation games throughout the NFL. 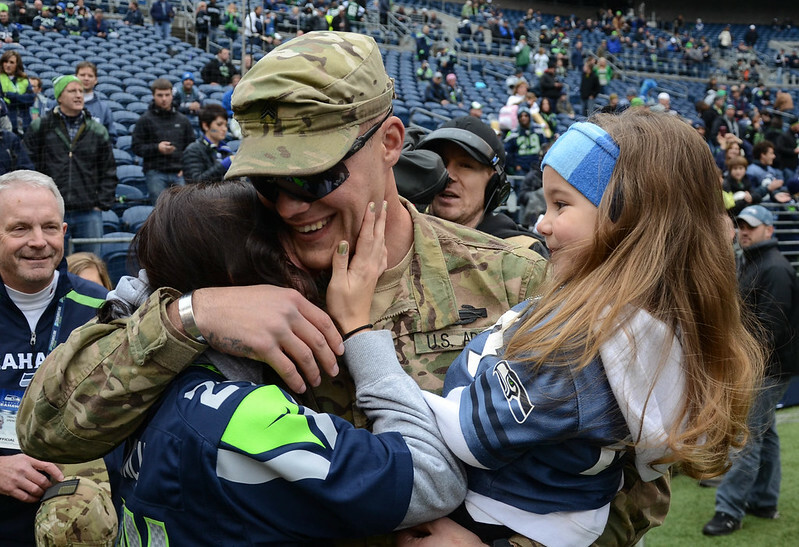 From the hours before kickoff to the final seconds of the game, the outpouring of support and appreciation from the Seahawks, USAA, and fans at the game was nothing short incredible. Although many of you may not have been able to experience it firsthand, please know that those who were in uniform and directly a part of the activities represented you well. 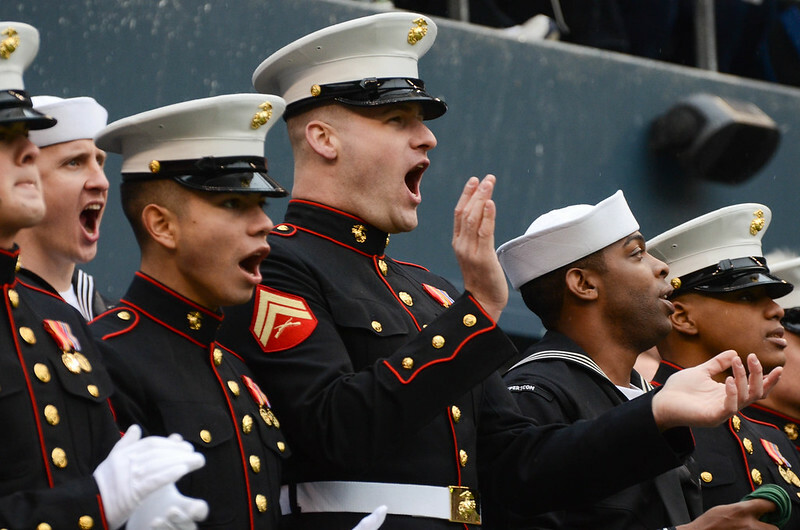 The appreciation given to them was directed toward everyone who has ever worn the uniform. Happy Veteran’s Day!